Merry Specials - Double Your Fruit! 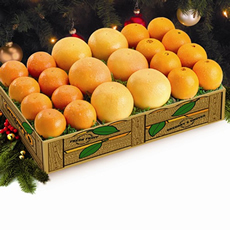 Home » Merry Specials » Double Your Fruit! 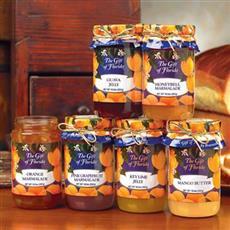 Four Premium-sized Varieties: Golden Navels, Tangerines, Ruby Red Navels, and juicy Tangelos. For a limited time, get TWO TIMES the fruit, plus, FREE Citrus Candies! The fruit was excellent and a nice variety. The order was placed as a gift to my children. The package was received on time and was delicious. Thank you. I ordered oranges for my dad for Christmas. He loved them but did indicate there were a few rotten oranges in the batch. The fruit arrived in Illinois in good condition. Thanks. Everyone Who received these boxed gift were happy with the quality. No bruised fruit and good flavor. We will definitely reorder. I sent the fruit as a Christmas present to my sister in Michigan. She loved it and shared it with her "housemates"
There was 3 spoiled items in the container. I sent these as Christmas gifts and got great reviews from all 3 families That I sent them too. Thank you I will order from you again. My entire 7 orders of fruit were received with great reviews. Thank you so much for making family members so pleased. Both families reported exceptional quality fruit! The order we placed went to Chelmsford, Ma. To our daughter and family. She was extremely pleased and loved the fruit. She said they were all wonderful. Thank u for sending such great quality fruit to help make this gift such a wonderful surprise. This was sent as a gift to relatives up north and their comment was that "The oranges were a big hit with the family!" Gregory's makes it easy to send gifts to relatives in other states. The quality of the fruit is reliable and the value is good. Thank you, Gregory, for taking some of the hassle out of Christmas shopping. Received in good condition and the fruit was great. Order was in good condition and the fruit was great. 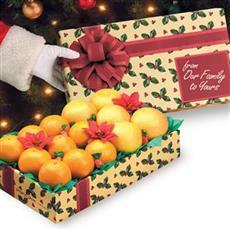 I ordered fruit boxes as Christmas gifts for family members living in Michigan. The produce was delivered on time and was reported to be absolutely delicious. It brought sunshine and smiles to everyone! My sister was very impressed with her order. My brother also like it. Will probably reorder this Christmas. The fruit was perfect & delivered in a timely manner. Given as gift. Arrived on time. They loved it!! My mother received these for X-Mas and she said they were GREAT! Only problem was that there were a few bad pieces of fruit in the package. I received the box containing 20 oranges, except for one of the oranges being mushy and pale in color( rotten), the remaining were delightful. The orange smell permeates the air when ever the skin in pulled back from the inner portion, and you can not help but reach for another! Very quick shipping and it was around holidays. Only thing I was disappointed was one of the oranges was spoiled. The amount the fruit costs I expected all the fruit to arrive in good condition. If it was a discount grab bag I could see this happening, but not with the price paid for this fruit. sent xmas gift to Iowa, very good! I submitted for three orders to be sent out by Christmas. 2 made it all right, the third one to Nevada was late and there were four oranges bad.